This indulgent recipe is inspired by the Spanish tradition of dipping doughnut-like churros into hot chocolate. Yum yums are a close relative to churros and you'll find them in the bakery section. 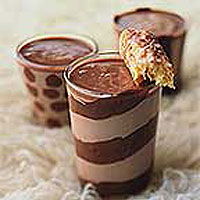 Prepare 2-3 small glasses: with the back of a teaspoon, swirl the chocolate spread across the base of each glass, then in circles, stripes or spots around the inside of the glass. Place the chocolate in a heatproof bowl. Place the milk and cream in a pan and bring to a simmer. Remove from the heat and allow to stand for 3 minutes, then gradually pour the milk and cream over the chocolate, whisking constantly until smooth and all the chocolate has melted. Serve the hot chocolate in glasses with the yum yums to dunk.